Cabinet hinges are a form of hardware that is often overlooked, but the right hinge can make a big difference in the function of the cabinet. 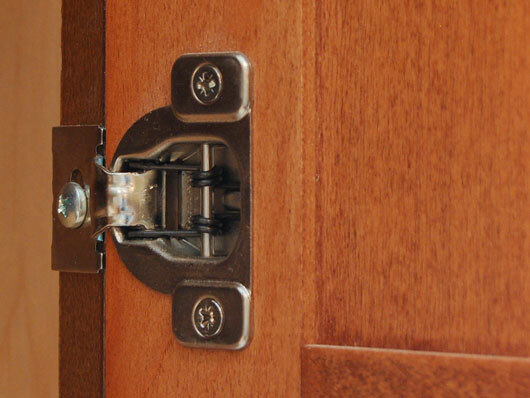 This silver cabinet hinge is hidden and provides a spring-action that helps the cabinet door to stay open or shut. A hinge is a moveable joint that connects cabinet doors to cabinet frames, and allows them to swing open and shut. There are almost as many types of hinges as there are styles of cabinets. Hinges range from plain and utilitarian to decorative, from delicate to sturdy. Depending upon the design of the cabinet and the functional needs of the door, hinges can be set flush with the surface, can be surface-mounted on the stiles of the cabinet, or can be wrapped around the cabinet stiles. Hinges are made up of two parts—the mounting plate and the hinge assembly. The type and number of hinges needed will depend upon the style of the cabinet, how far you desire the door to open, and how large the cabinet is. For cabinets less than 40" in height, two hinges will typically do. Hinge openings generally range from 100 degrees to 170 degrees, although wrap-around hinges will allow doors to swing open more than 180 degrees. In situations where the hinge and/or cabinet itself needs to be concealed, special invisible door hinges, such as Soss hinges or Barrel hinges, allow doors to slide in and out without blocking the view.